The Versa certainly looks very smart indeed. What it also shows (for me) is that the new Plymouth Citybus logo has enough white within it to preserve their house colours. The swoop I have never liked and to me spoils the overall effect which just looks so much more professional without it and tacky with it. Does this not prove that the swoop is unnecessary, especially if their rationale behind it was to include an element of white within the livery? I have to agree with the previous comment that the swoop needs to go. I agree, the swoop is not required... Look - There's room for external advertising too! Save money in the paint shop, and earn money on advertising. Wonder if Citybus see the logic? Although I can see what you mean, the Versa does look smart and the large logo does work well on plain red, I have to disagree about the swoop. As long as it is applied correctly and does not peel off (later ones seem to be better) it does look smart in swoops. It just makes them look different - no one else out there does it! You hardly notice the swoop from inside. Citybus do seem to be cutting down on external adverts on the new livery and using their buses to promote their business which can only be a good thing. No need to simplify the livery just to accomodate adverts! I like the shape of the versa, and hope that we (pcb) get some to replace some of our older darts. I read that someone commented on the wheelchair bay only accomdating 1 wheelchair or one pram. this is only a demonstrator so may have a different layout when orders are made? I like the swoop but also like it without it. look at London? they don't have swoops on their buses? if I had a choice of the versa or a door forward streetlite, then the versa would win hands down in terms of street appeal. agree that the Versa looks great - much better than the StreetLite! Really cant see Citybus getting any in the short term as they are clearly after more DD capacity at the moment rather than anything else. So I gues its more Enviros, although I am not a fan of these at all. Boring to look at and feel too plasticy inside. 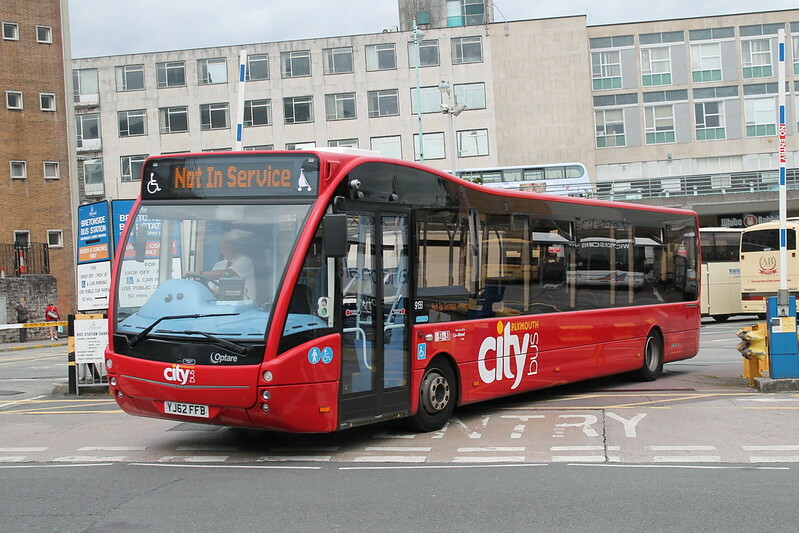 That said its great to see Citybus buying new DD again so cant be to fussy! wonder if PCB will introduce special fares for Saltash. 43A doesn't seem to be doing well. Fares too high. How about a 13£ week ticket for use on all Saltash services? Lovely bus yesterday I was on the x80 coming back from paignton and I saw it as the 45 and also today I have seen it as the 45. The Versa was on the 45 again today. Is this the only Versa bus? Are they keeping it or is it on trial? Thanks. Any idea on when the Enviro 400's will be arriving? A driver of the 21 last Saturday said next week (so this week then).I believe Brian mentioned a while ago they'll enter service together with a launch event once fitted out/painted etc at the end of July. Whenever it is though it's definitely sometime soon! they should be due early july, get kitted out with radio's etc then launched end july. will keep u posted!